World football governing body FIFA is investigating a video in which Croatia defender Domagoj Vida appears to shout "burn Belgrade," the Serbian capital, after his country’s World Cup quarter-final win over Russia. Vida escaped with a warning from the organization after a video emerged of him shouting "Glory to Ukraine" along with team trainer Ognjen Vukojevic shortly after the game. The Croatian team announced they would send Vukojevic home over the incident. 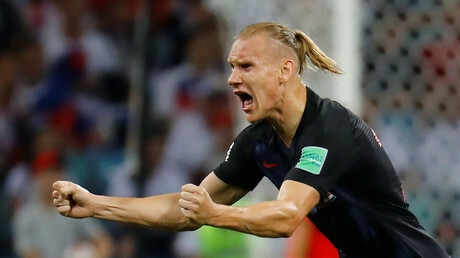 Now fresh footage has emerged reportedly taken after the match of Vida drinking beer and again shouting "Glory to Ukraine," before appearing to shout "Belgrade Burn!" Former national team and Bayern Munich striker Ivica Olic, now a member of the Croatian World Cup team’s training staff, can be seen in the video sitting next to Vida. Former Dynamo Kiev player Vida scored in Croatia’s quarter-final match with Russia in Sochi to make the score 2-1 in extra time. The hosts then found an equalizer to force a penalty shootout, which Croatia won 4-3. A harsher punishment would be expected from FIFA should the investigation find Vida guilty of breaching its rules on political statements, despite the player later posting on social media the message of the first video had been "misunderstood." Croatia’s win over Russia on Saturday gave them a place in the semi-final, where they will meet England at Luzhniki Stadium in Moscow, with a first ever World Cup final for the Balkan nation at stake. Reports in Serbian media have suggested the player, 29, may not be referring to the Serbian capital, but instead talking with customers at a pub called 'Belgrade' in Kiev and instead of wishing it to burn, was in fact encouraging its owner 'Jovan' to have a party.